My competitive side loves the world of work's sense of humor. Much is written about the ever elusive notion of work/life balance and how differently this concept is applied in the modern world. Should we compartmentalize our lives into neat little time slots? Should we only check email twice a day? Should I only focus on three tasks every Monday? Do I have to be present for every single thing in every part of my life every time? I'm exhausted trying to figure out how not to be exhausted. As our scope of responsibility grows...our project list stretches into double digits...and apparently everyone on Earth feels compelled to send us email...we need to stop doing one important thing. Stop trying to "find" balance. "Balance does not have an address. It is not hidden on a website. You can not sign up for balance through an RSS feed. Nor can you register for balance at an event. Balance is a fantasy." For those living in the modern world it is impossible to separate work and life. That is not a bad thing...in fact, it is quite freeing. Stay with me now. Once the pressure to turn off work and turn on home (or any other non-work part of your life) is no longer present, your complete life can simply flow. My friend Doug Shaw understands this concept and has helped me understand it too. Don't let unrealistic concepts force you to live an awkward life. 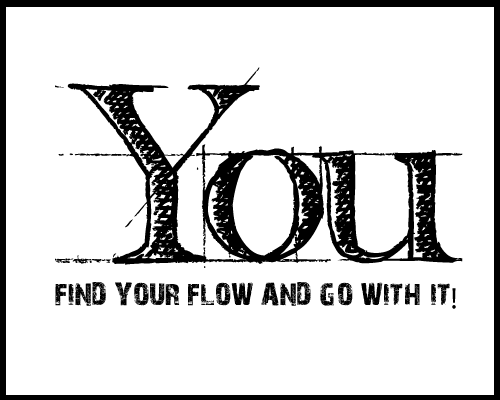 Life is about flow...and it is a powerful way to integrate all of the pieces of your world. Have you allowed yourself to believe that balance exists in your life; or, have you embraced your whole life as one flowing experience that integrates everything that you are? I'm glad I listened to Doug when he said "flow beats work/life balance." He was right.